Jean Paul Gaultier is one of fashion’s most eccentric designers. Famous for the work he created for Madonna’s world tour during the 1990′s, he is never afraid to go against the grain. 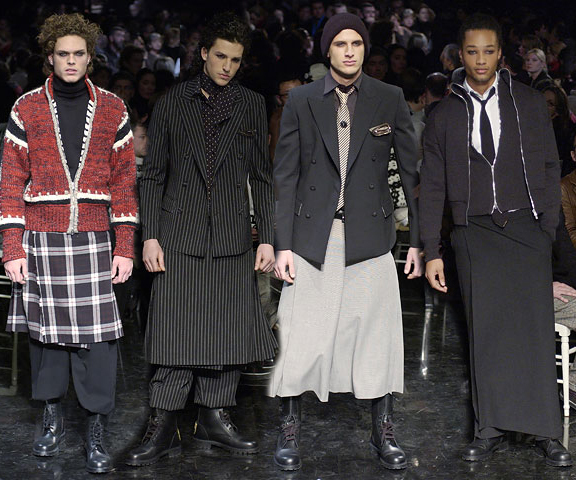 He pushed the limits with his skirts for men which, he’s shown previously. 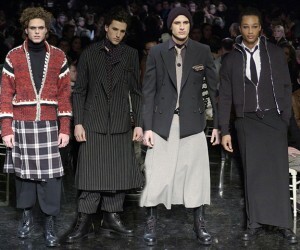 But now with celebrity men like Kanye West, Gerard Butler, Diddy and Vin Diesel wearing skirts over the last couple of seasons I’m sure Gaultier’s designs will be picked up by a few men who aren’t afraid to try something new. For Fall 2012, one of the trends is layering and we see plenty of it in this particular collection. Combining textures of fur, leather and wool were interesting ways to put some of these pieces together for the season. Printed tattoo style shirts worn under a blazer or layered over another shirt were just a few of the ways the wardrobe was styled for the season. One thing was consistent – finishing the look with a cool hat. What are your thoughts on these designs for Fall?